Will Janet Yellen Raise Interest Rates? Subject: Will Janet Yellen Raise Interest Rates? The U.S. Federal Reserve began its two-day September meeting this morning (Wednesday) and investors are wondering whether Fed Chairwoman Janet Yellen will decide to raise interest rates now. And even though we're just a day away from Janet Yellen's press conference – which will take place Thursday at 2:00 p.m. – we're still in the dark about whether an interest rate hike is coming. Fed officials have now entered their self-imposed blackout period, when they cut off communication with the media ahead of the press conference. It looked like we were destined for the first interest rate hike in almost 10 years until extreme volatility hit the markets in August. A stock market crash in China sent ripples through global stock markets, and the Dow Jones fell 13.4% from July 20 through Aug. 25. The Nasdaq and S&P 500 were down 13.5% and 12.2% in the same time frame, respectively. 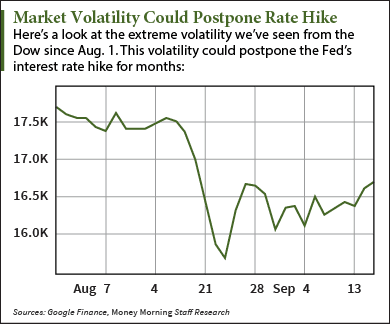 Now many economists believe a rate hike will be postponed until the FOMC meeting in October or December. Some believe it could be pushed back until 2016. According to a Wall Street Journal survey, just 46% of economists polled expect the Fed to raise rates this week. In August, that number was 82%. Barclays' analysts have also pushed back their estimate on the next Fed interest rate hike. The investment bank previously expected the U.S. central bank to boost rates this week. Now their call for the first increase has been pushed out to March 2016.